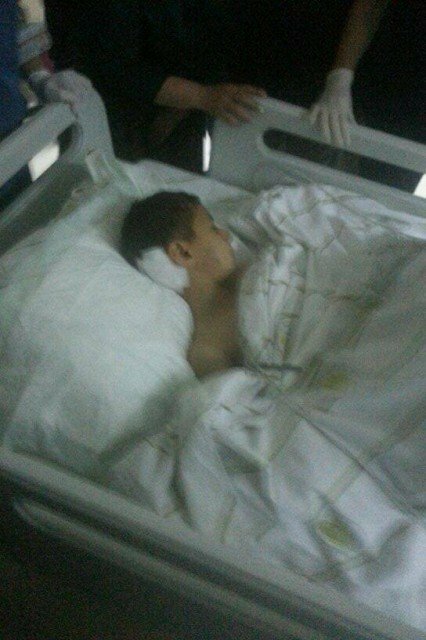 A 10-year-old boy has been critically injured after reportedly being hit by a police tear gas canister at a rally in the Turkish city of Diyarbakir. His father, Mehmet Ezer, said his son, also named Mehmet, had been hit at close range at the end of the rally held by the pro-Kurdish Peace and Democracy Party. A photo taken in hospital shows the child with his face covered in blood. The death of another boy hit by a tear gas canister, after a nine-month coma, sparked protests earlier this month. The Peace and Democracy Party has been campaigning in a mayoral election to be held in Diyarbakir, in south-west Turkey, on Sunday. Among the party’s demands is the establishment of a regional parliament in the city as a move towards autonomy for the Kurds. The Kurdish rebel group, the PKK, has been on ceasefire for a year. But frustration is growing among Turkish Kurds at the slow pace of the reforms they expected in return for peace. More than 40,000 people have died since the PKK launched its insurgency 30 years ago. In the latest incident, Mehmet Ezer apparently ventured outside after the rally ended peacefully on Tuesday. “We were at home with his mother,” his father said. Mehmet Ezer Sr. said doctors had told him his child would have to remain in intensive care for 24 hours for his condition to be assessed. Interior Minister Efkan Ala launched an inquiry, saying action would be taken if anyone was found to be at fault. Another boy, Berkin Elvan, was 14 when he was struck in the head by a canister during mass unrest over the redevelopment of an Istanbul district, Gezi Park, in June. He had reportedly been on his way to buy bread at the time.